If you're thinking of traveling to the cities of Anaheim, Chicago, Houston, Las Vegas, Los Angeles, Miami, New York, Orlando, San Antonio, San Diego, San Francisco, or Seattle between August 1, 2012, and December 31, 2013, the travel agency Best Day and the famous American department store Macy's a fantastic experience. If you're thinking of traveling to the cities of Anaheim, Chicago, Houston, Las Vegas, Los Angeles, Miami, New York, Orlando, San Antonio, San Diego, San Francisco or Seattle between August 1, 2012, and December 31, 2013, the travel agency Best Day and the famous American department store Macy's have teamed up to make your vacation, shopping trip, or business visit to the above destinations a fantastic experience. When you book a hotel or vacation package with Best Day, the largest online travel agency in Mexico, you and your fellow travelers will be given a discount coupon to be used in any Macy's store in the US. This coupon is valid for 10% off the final price of merchandise bought at Macy's. Even if the product is already discounted, the additional 10% will still apply to Best Day customers. The discount coupon expires after 30 days. With over 150 years of tradition and 800 stores across the US and Puerto Rico, Macy's department store stands out for offering a wide range of high quality products for the whole family and the home, as well as for having fantastic discounts year round. 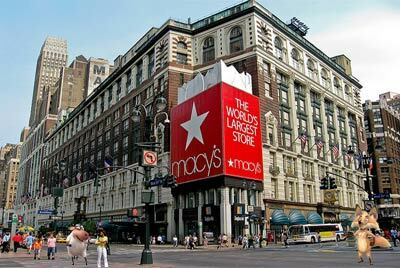 If you're a compulsive shopper, a fashionista, a bargain hunter, or just somebody who buys the bare necessities, make the most of the fact that Best Day and Macy's have come together to help you enjoy your next shopping trip to the US to the fullest..